I first wrote about Heavenly Organics back in 2013 when I had purchased a sample pack of products, see my review here. They recently got in touch with me to see if I would like to review a couple of products again and I was curious to see if I enjoyed them this around too. The entire Heavenly organics range is vegan and I know that this is important to the founders own vegan ethics, Increasingly a lot of people want the ethics reflected in the entire range and not just to cherry pick products and I think that is fair enough, they also carry the Vegan Society stamp for extra assurance. Being currently obsessed with citrus scents I chose the Orange and lime scrub and body butter and they don’t disappoint if you after a zesty hit. Although I have been known to complain if a company calls itself organic in the name but doesn’t have certification I can’t fault Heavenly organics ingredients and labelling, you can see at a glance which ingredients are organic and only simple, natural ingredients are used so you won’t get any nasty surprises. The products come housed in simple glass jars with metallic lids, the products are simple, honest and extremely budget friendly which I appreciate. 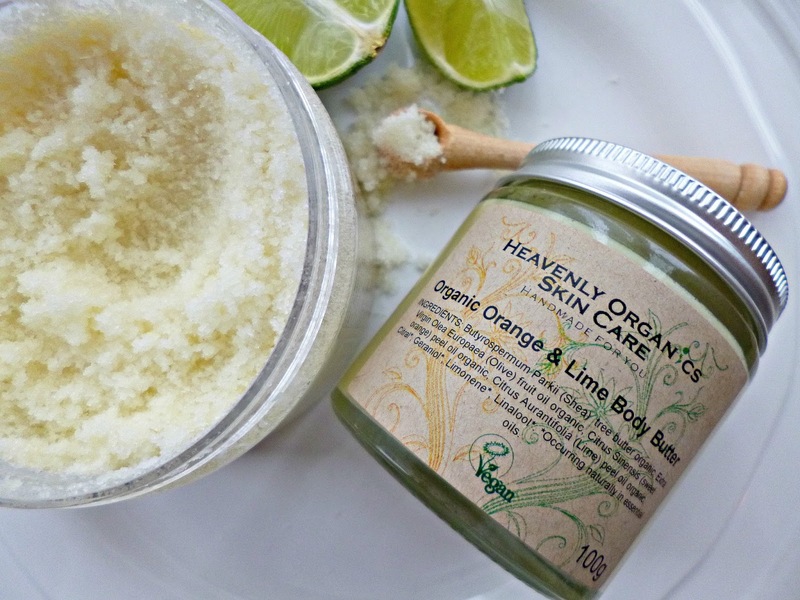 The Orange and Lime Body scrub is made with sea salt, olive oil and zesty citrus essential oils. The citrus is really bright and fresh, in fact I would say it smells like sherbet, when you open the jar you can really smell the bright scents. The texture is light and fluffy, I find it easiest to take some out of the jar with a scoop and apply section by section to damp skin. It leaves skin soft but not greasy and feels substantial without being too grainy. I usually pay two or three times what this scrub costs for some of my favourites, so was pleasantly surprised at the price. Although I won’t be ditching all my other scrubs completely this has found a place in my everyday shower ritual and would be a product I will happily repurchase. The Orange and lime body butter is completely waterless and very concentrated, the main ingredients are Shea butter and Olive oil making it perfect for very dry skin. Although this has the same citrus essential oils, it isn’t quite as punchy as the scrub because the nutty scent of the Shea Butter does come through, it is still gorgeous though! When you take it from the jar the body butter can feel very heavy and thick, I find that taking a small amount at a time means that you can warm it up in your hands making it a silky oil before applying as otherwise Shea butter can be a little grainy. Just like the scrub I think this is great value for money and perfect if you are looking for natural products on a budget. A great brand to look in to if you are in the UK, they do ship to some countries in Europe and beyond but best to check on the website if they ship to your location www.heavenly-organics.com.